The original St. Isidore’s church served the community faithfully for over 50 years. The church building itself evolved, adding a taller bell tower and white siding. Father Henry Plunkett came in 1952 and watched as the church membership grew too large for the facilities. The new buildings moved quickly. First the school was completed in 1958, designed by Jack Buchter, A.I.A., of Lafayette and assisted by James Crossen of Danville. The contractor was George Hanson of San Leandro. The school was conducted by the Sisters of the Third Order of St. Francis and a convent with chapel was situated adjacent to the church. It was formally dedicated in 1963. Since the Sisters were not ready to open the school in 1958, the rooms were rented for public school classes from 1958-1960. The Danville School District was overcrowded and scheduling double sessions. Bruce Marhenke recalls that Montair School opened in 1958 and four classes, dubbed the “Montair Annex” were conducted at St. Isidore’s for the next two years. They also had an office which the teachers shared. When Vista Grande opened in September, 1960, most of the students went to that school. The boundary line for Montair and Vista Grande was Danville Blvd. Marhenke was the first principal for Vista Grande and recalled students cutting across open fields down Bobbi Lane to school. The freeway was not built from Walnut Creek to Danville until 1964. By 1961 the new St. Isidore’s Church and rectory were completed and, in May of 1962, the church was blessed. The old church and rectory were razed in 1963, to some tears. Friz Fereira, whose grandmother had so faithfully tended the church, handled the land’s sale. As the congregation grew, additional improvements were needed. In early 1978 the Msgr. Julius Benson Community Center was completed. 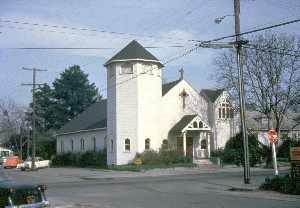 The next year with the parish population reaching 2,4000, St. Joan of Arc Parish was established. In 1994 the diocese decided to improve the facilities instead of creating yet another parish when the parish census reached 3,600. Today La Gonda Avenue has St. Isidore Catholic buildings on both sides. The school has expanded to include, administrative buildings and a double gymnasium, the Rettig Activities Center, Kids Konnection for baby and child care and a Youth Center with activities and meeting space. Local drivers all notice the creamy white statue of St. Isidore the Farmer on La Gonda, erected in 1985 on the 75th Anniversary of the parish and dedicated to the memory of Msgr. Julius Bensen. Msgr. Bensen was recognized as the builder of the church, school and rectory on La Gonda Way where he was Pastor from 1959 to 1978. From a little country parish, to a thriving twenty-first century one, St. Isidore’s has been blessed by energetic pastors, diverse programs and generations of faithful parishioners. Congratulations are in order for its Centennial. Sources: From Here and There, Al Gentile, April 3, 1999, museum archives, Jubilee programs, St. Isidore Church web site, Walnut Creek Courier-Journals.